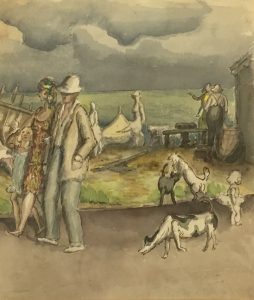 He studied art and went on to have studios at Bolton Studios, South Kensington and later, in 1910, at College Place, Brighton. In Brighton he met Charles Lambert Rutherston (whose fortune came from an inherited woollen business), who became his friend and patron. (Rutherston gifted works, including at least 5 by HHR, to the people of Manchester, now known as the Rutherston Gift at Manchester City Art Gallery). 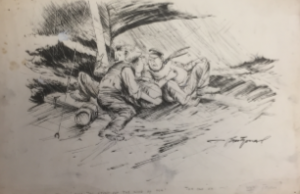 He was skilled in a variety of drawing techniques and media, combining ink and graphite, charcoal, pastel and wash. 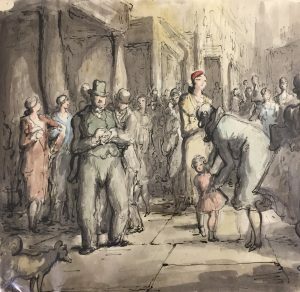 Exhibited at the New English Art Club, Royal Institute of Painters in Watercolours, National Society of Painters Sculptors and Gravers, The Pastel Society and the National Society of British Artists and at the Royal Academy in 1927. An English artist and lecturer in historical costume and theatre history. She was also a portrait artist, working in various media – watercolours, oils & pencil. She is most noted for her Second World War pictures of women engaged in war work. In 2002 the Imperial War Museum acquired fourteen of her works, mostly depicting uniform production in wartime clothing factories. She returned to the Central School in 1944, lecturing in Historical Costume for almost forty years. In the 1960s she provided to historical costume advice for several feature films, including 55 Days at Peking (1963), and The Fall of the Roman Empire (1964). 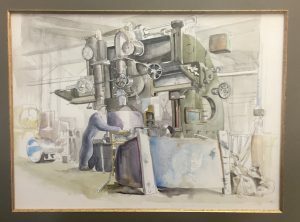 in industrial settings part of her commission as WW2 war artist. 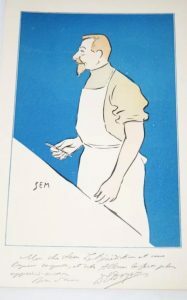 “Un Vrai Mathurin” from 1905 (?) edition of La Vie Parisienne. reputation and he became a member of the Salon des Humoristes and the Legion d’honneur in 1904. He arrived in Paris in March 1900, at the time of the opening of the Universal Exposition picking horse racing as his means of entry into “society”. 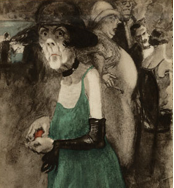 3 months after his arrival he self-published an album, Le Turf, caricaturing many prominent Parisian socialites. 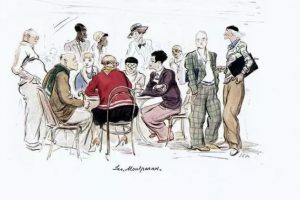 Followed by Monte-Carlo in 1905, Sem a la Mer (1912) Tangoville Sur Mer (1913) and Le Vrai et Le Faux Chic (1914)After WW1 he continued his depictions of the great and the good at play – including in 1919 Le Grand Monde à l’envers (High Society upside down) and in 1923 La Rond de Nuit and Le Nouveau Monde. He also provided menu illustrations for Parisian cafe Maxim. In 1927 he published the album White Bottoms, about tango and with a big American influence. 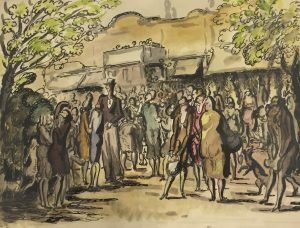 Cyril Bouda is acknowledged to have been one of the best Czech twentieth-century draftsmen and illustrators. 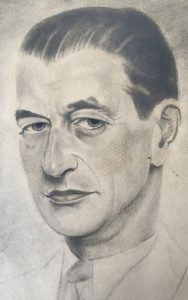 A student of Kysela and Švabinský, he became a master of illustration. Besides many illustrations, he is also known for his tapestry designs. In his drawings he displayed a strong affinity to the Italian Renaissance. His work shows a strong sense of narrative and a sense of detail and humour which makes him a particularly appropriate illustrator of the Prague Legends. Bouda was also a dedicated teacher throughout his life. His enjoyment of music and poetry meant he mixed with many other artists, for whom he made illustrations or portraits. He was also an accomplished graphic artist. 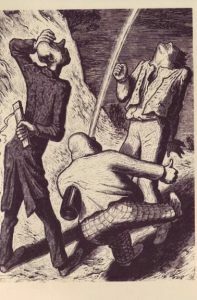 His rich coloured illustrations for Legends of Prague have a great sense of narrative and energy and his black and white illustrations for “Jerks Kozu” have a surreal quality that evokes Mervyn Peake’s illustration of The Hunting of the Snark. 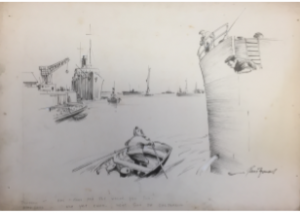 Herbert Samuel “Bert” Thomas contributed Cartoons and Character drawings to The Humorist and Punch magazines and was the creator of British propaganda posters during the First (he was made an MBE in 1918 for his contribution to the war effort) and Second World Wars. 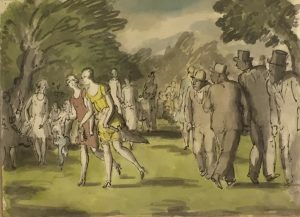 Although born in South Wales he moved to London in 1900 and many of his cartoons featured London scenes and characters – cockneys and toffs! “Lambeff” (already snapped up I’m afraid!) 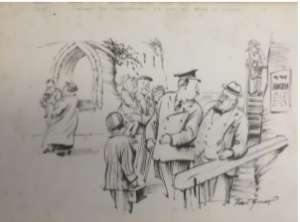 and a caricature described as being of GK Chesterton (but if time travel was real I would swear it was Ian McEwan!) and a wartime poster “Is your journey really necessary?” – also sold (to be put to new purpose supporting an eco-initiative). 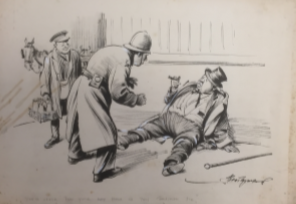 More recently I acquired a collection of 20 of his original 1930s cartoons most of which appeared in The Humorist (in fact I managed to track down the edition in which one of them appeared – which is available to accompany the original). There are a couple framed in Off The Wall and of course the others can be easily framed to order! Wife to husband taking a drink “go easy with that stuff. It’s the only mirror I’ve got. You’ll never find your way home in that condition Sir. Why not? Why should I fail Thish time? The young VN – Don’t this storm put the wind up yer? The old VN – Wot storm? Boatman – Ere – can’t yer see where yer goin’? Deck Hand – ‘Not yet chum. We’re goin to Orstralia’! French artist and Illustrator, born in Nancy. He was a pupil at l’Ecole des Arts Decoratifs in Paris and his work was exhibited at Le Salon d’Automne and Le Salon des Tuileries between 1923 and 1933. 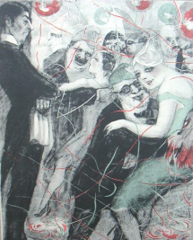 His main body of work was created in the 1920s in Paris, including his self-published limited edition folio collections “La Faune des Dancings” (the wildlife of the Dance Halls) (1925) and “Le Baccara” (1926). of watercolour. 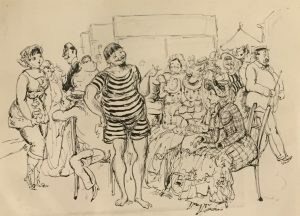 He also recorded the French theatrical community with portraits/caricatures of actors, some in their best-known roles, such as Louis Joubert as “Le Trouhadec Indigne” and the clown Grock. He illustrated Les Amertumes (Bitterness) by Andre Haguenauer in which he used a more expressionist style (also 1925). 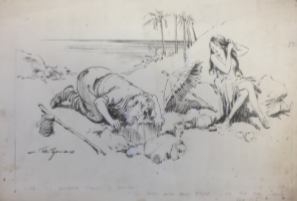 His illustrations for Alfred Marchard’s Printemp Sexuel would certainly be viewed now with great suspicion, including as they do, children in overtly sexual poses. Le Rire (Laughter) and he was a court artist at the trials of the collaborationist Vichy French government (Petain, Maurras & Laval). British racing motorist, journalist and artist. In 1906 Davis became an apprentice with the Daimler Company and trained as a draughtsman and, in 1910, joined the staff of Automobile Engineer as a technical illustrator. After demobilisation at the end of the First World War he became sports editor of The Autocar. Davis aided his prewar motorcycling associate, W. O. Bentley, in starting his company becoming one of the famous Bentley Boys of the late 1920s, winning the 24 Hours of Le Mans in a Bentley in 1927. He was first V.P. of the Aston Martin Owners Club in 1935, designing the Aston Martin “wings” badge. He wrote numerous serious journalistic books about motor racing illustrated with photographs and several more light hearted ones, some published under the pseudonym “Casque” which he illustrated himself with line drawings both humorous and technically detailed, apparently taking particular pleasure in mechanical disaster and driver fallibility! We have prints of many of these illustrations on The Wall. 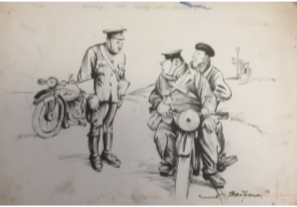 For those interested in motor racing – His drawings give a unique insight into the world of racing and racers between the wars, the relationships between drivers, their racing cars, the mechanics who kept them on the road and the officials who helped keep the drivers on the straight and narrow! Taking us back to the time when the same drivers took on the Brooklands banking, the Le Mans roads, the snows of the Alpine and Monte Carlo Rallies and the Mille Milia. And at a time when the challenge of keeping the cars on the road was such that the mechanics travelled in the cars alongside the drivers in order to provide trackside mechanical 1st aid! But above all they’re about the humour of human fallibility when tested by human and mechanical frailty.